The Emirate of Dubai is the second largest of the seven United Arab Emirates. It has the largest population with just over 2.1 million inhabitants. Dubai’s dynamics are ever-changing – here everything is exaggerated in the hopes of being bigger and better than the rest. Of course the influence of traditional Arab culture is prominent in its museums, festivals, music and national attire. A lot of beaches here are awarded the Blue Flag certification for adhering to strict international standards. Abu Dhabi, the capital of the United Arab Emirates lies on a T-shaped island which is home to the Abu Dhabi Emiri Family and the President of the UAE. There is so much to do and see here that I will only cover just a little part of my experience. The Atlantis Dubai is a hotel like no other I have ever stayed in, It is a HUGE hotel with an endless amount of things to do. This comes at a price! The queue for breakfast is long, you get a badge upon check in which you have to show the staff at every corridor of the hotel. Annoying yes, but for security sake, why not? I stayed here for three nights on my very first trip to Dubai. After that I have stayed at two other hotels in Dubai. In an apartment hotel, and honestly loved the apartment more than the Atlantis experience. That said, I would still recommend staying at the Atlantis for at least a night. The view is simply amazing, Out of this world. So yes, Dubai is over the top exaggerated but it is a place I would advice everyone to visit at least once in their lifetime. There are many expatriates in the city, and you can really enjoy a great holiday here. The reason I have returned to Dubai on so many occasions is that I love the feeling of being able to live this lifestyle for a few days, then returning to my simple reality. I cannot imagine living here, nor would I want to. I found the people to be always friendly and welcoming. Never did I get the feeling of being “out of place” or being clearly a tourist as I have in other places I have visited. Moving around in Dubai or Abu Dhabi is easy with a rented car. Getting around is faster than public transport and fuel is CHEAP CHEAP CHEAP!!! The metro system works similarly to the European metro systems that I am used to ( colour coded and easy to navigate). The experience lasts for roughly seven to eight hours! It is a fun experience which begins with a 4X4 picking you up at your hotel at around 14:00, and will drop you back off at about 22:00. Can you visit the United Arab Emirates without seeing “The Burj”? Now there’s The Burj Al Arab and The Burj Khalifa. The Burj Al Arab Jumeirah was the first real great symbol of modern Dubai. You can arrive here by either a chauffeur-driven Rolls Royce’s or by a helicopter transfer service. It is a wonderful experience and this beautiful hotel boasts nine restaurants and bars. You will not eat here without reservations! Don’t even bother trying your luck! The Burj Al Arab Jumeirah is extraordinary and it is no wonder it has been repeatedly voted the world’s most luxurious hotel. When you hear people talking about the United Arab Emirates, the conversation will always lead to The Burj – the most iconic destination in Dubai! The Burj Khalifa is 828 metres high (2,716.5 feet) and the tallest building and highest outdoor observatory in the world. It is advisable to book your tickets online and well in advance. I have seen people waiting in line for hours on end to get to the top. This could cost you a half a day during your trip so plan wisely! We tried the skydiving experience while in Dubai. Here is something a little different. On 21 April 2014, with permission of the authorities and support from several sponsors, highly experienced French BASE jumpers Vince Reffet and Fred Fugen broke the Guinness World Record for the highest BASE jump from a building. After they leapt from a specially designed platform, built at the very top of the pinnacle, at 828 metres (2,717 ft). Watch the fantastic video! It’s awesome! The Mall of The Emirates is the largest mall I have ever been to. This place is fantastic. From lifestyle, fashion, sports, make- up, electronics, and home furnishing products. This mall has over 600 stores so you will find everything your heart desires. It is also Home to the Ski Dubai slopes, the Magic Planet indoor entertainment centre (great for children) and the Dubai Community Theatre and Art Centre. The Dubai Marina Mall is not as large as the Mall of The Emirates, it does have a large range of international retailers as well as affordable high-street shops, fashion and beauty services. located along the shores of the marina it is great for outdoor seating along the water’s edge. The Ibn Battuta Mall gets its name from the explorer, was a Medieval Moroccan Muslim traveler and scholar, who is widely recognised as one of the greatest travelers of all time. The mall has six courts its inspiration and from Andalusia, Tunisia, Egypt, Persia, India and China. The lush outdoor tea gardens are gorgeous! There are ATMs in the UAE that dispense gold bars. Dubai has no address system, no zip codes, no area codes and no postal system. The capital of the U.A.E. is Abu Dhabi (nope, not Dubai). Bigger in area than all the other 6 Emirates combined. Dubai ranks third in cities with highest number of skyscrapers (148 skyscrapers in Dubai), and Abu Dhabi ranks 27th (30 skyscrapers). Have you been to the United Arab Emirates? Or planning to visit soon? What did you experience or what have you heard about the Emirati? Please share with me in the comments section below. Lovely post on UAE.. there’s so much to see/do in Dubai!! I really hope that we will get to visit Dubai one day – I agree that it seems to be a place everyone should try to visit in their lifetime. I would love to visit the Burj Al Arab after fantastic report from some friends of ours that go a couple of times per year. Base jumping is definitely not for me though ! I’ve never been to Dubai, but the desert experience looks so so amazing, I might have to add it to my list! Oh my god, check you out, with the base jumping, I would of crapped it lol! Me and my daughter are going next year to Dubai and I can not wait. I think you will have an amazing time there, it is wonderful, and because there is so much to see and do, time will fly by so quickly. Awesome writing about Dubai. I was not aware of many things mentioned in the post like address system and zip codes. It’s really surprising. Thanks for writing everything in detail. I share your post on Twitter and SU. Thank you so much Manoj! I have never been to Dubai but would love to! Your post was great! The desert safari looked so interesting and that video was to good! Thanks for sharing. Great synopsis of these travel destinations! I have fond memories of visiting my friend in Dubai. I was just in Dubai last October. It’s a very efficient place to visit. I love the night life and the sights and sounds. I haven’t been to the Middle East yet, but it is on my list, I love exploring and your photos and story really make me want to book a trip. Perhaps next year will be the year. I really hope you do get to go and see it, it is wonderful. If you have enough time, try to see Abu Dhabi as well. It is too underrated. wow, so incredible! Dubai always strikes to me to being such a fantasy world in a real world! I can’t wait to visit and your photos are very inspiring and can only image the Atlantis Dubai level of comfort!! It truly is, it is very over the top! I like it for visiting, seeing sights, and shopping, not sure if I could actually live there. Ya. Was there a few years ago and its a wonderful place. Loved the desert safaris and the nightlife the most! Nice pictures too! You had such an awesome experience. Dubai is on my bucket list. So beautiful. I was just talking to a friend of mine yesterday about HOW WE NEED TO GOOOOOOO to DUBAI!!! It would be such an epic trip – and you’ve made it even more clear through this blog post – and um, did I see… BUFFET? lol! You would have lots of fun if you went there with friends. It makes the holiday entertaining in a different way. Wow! Very informative and makes me want to visit UAE right about now 🙂 One question though, if there’s no postal system, how do you send letters and postcards to and from UAE? Mostly P.O. Boxes are used and that is how people receive their letters, or they have it sent to company names, so you could send something to “Apple, or Sony”, then name the location like Johnson Towers, 20th Floor, just an example. Include the name of the person and the receptionist would collect the mail for you, or you would come out to sign it. This is also the main system in African countries, although there are street names there. Funny enough, We just got home from Abu Dhabi a couple of days ago, Love this place and travel there frequently at least 3 times a year. I recommend it to anyone and your post is packed with so many things to see and do which is helpful for anyone who has never been. I’m going to Dubai in less than a month! We opted for a hot air balloon ride instead of a desert safari. This post has got me all excited! I can’t wait to visit Dubai and your post got me even more excited! I think I would appreciate the apartment style accommodation more than the Atlantis hotel experience as well, but like you said I’ll definitely want to try Atlantis for at least one night. Sounds and looks like you had a great time! ATM’s that dispense GOLD BARS What!? Thats insane haha. I have never been to UAE but its somewhere I would like to go one day, just to experience what its like. thanks for this post its really informative and gives lots of great advice about things to do there. To be completely honest UAE has never been in our list because as you say, everything is over the top, it seems so unrealistic to me!! However, I would love to go for the Desert Safari, I didn’t think it lasted that long, you sure get a feeling of life at the desert after that! Thanks for sharing this! In September I will fly to Malaysia and we will have a stop over for one day in Dubai. I know, pretty short, but better than nothing! I am really curious though. It must be such an exiting place after reading this. Even one day is great for seeing places, there is so much there to do and lots oyu can pack into one day! Weekday or weekend you have plenty choices. Have fun! I spent a week in the UAE visiting a friend who lives there about two years ago. I spent the majority of my time in Dubai but also spent a day in Abu Dhabi and a day in Sharjah. I did the Burj Khalifa and a desert tour as well. It was crazy nice and different. There are so many malls there! Your photos look really great and give me a good impression. The Atlantis Dubai truly looks like from old Oriental fairy tales. Most interesting sounds to me the Camel Safari, 8h for 120 EUR doesn’t even sound that expensive! Hi Hendrik. for the experience, fun, entertainment, food and drinks, I would say it is a pretty great deal. Especially when a car comes to pick you up and drops you back off. Comfort level is top! I only had the chance to visit the Emirates in stop overs, last time actually was just 2 days ago, when I had a short layover in Abu Dhabi. I have visited Dubai before on my way to India, when I had 8 hours to spend there and I loved walking around the Burj Kalifa and the Dubai mall and then head over to see the famous Burj an Arab. I was very impressed by the Emirates and I actually thought of coming back and spend a week in the area. I did visite this place with my family. It is very beautiful. Love everything about it, the food, places we visited, the gold market. Did you visite this market? I definitely want to visite Dubai again. Love reading your experience. Beautiful pictures. You’re so adventurous! Skydiving AND camel riding- what a memorable trip. I’ve never had Dubai on my list but I may just have to add it now. I have heard of more and more people going and loving it. This is high on our list of placed to visit next year. We want to stay at the Atlantis too! I’ve heard tons of good things about Dubai, that it is an open-city and you will never feel lonely. With lots of things to enjoy, I think they are quite right! What’s your most favorite hang-out in Dubai? Wow sounds amazing and looks beautiful based on your photos. I have some friends who live in the UAE and it sounds fascinating! I’d love to go there one day, your pictures look beautiful! I have only visited Dubai airport for few hours during flight transit and did shopping from there. I’d love to visit this city known for its its largest, tallest and biggest someday in my life for few days only! Though I too feel that I can’t stay there for a longer time as its very different from the place where I live! Wow a very impressive post about the Emirates! I don’t know if I could do a base jump like that! Holy smokes! I do think the camel safari sounds really neat though. Beautiful pictures! Wow, wow, wow! That’s all I can say. I’ve always wanted to travel to Dubai, but was so intimidated by the unknown. I’ll have to bookmark this article to share with my family. Great job! I have heard a lot about Dubai. In fact I have been to the airport (En Route to India) but never got a chance to visit the place. Looks like you had a good experience there. I have heard, shopping is awesome in Dubai as well. Dubai is so beautiful. I hope to visit one day. Thanks for sharing those interesting facts. If there is no address system….how do they find their way around places? I want to travel to the UAE badly! I almost took a teaching job there a few years ago and I talked myself out of it….after seeing this post I am kicking myself! Oh wow, that hotel looks amazing! I would love to ride a camel too. I don’t think I could do the skydiving though. Yikes. Too scary for me! Omg! I’m so jelly I really want to go there one day! The buildings look beautiful! Nice post! Interesting points about Dubai! Especially the part that Dubai has no address system or post. How do they find a place then? How are GPS’s working, and how do they receive packages and delivery? Do you have any idea? Also I’m curious about the restaurant prices, we want to travel there, and my friends that visited say it’s very cheap. However, I doubt a place so luxury can be cheap. Let’s say a nice evening dinner in a good restaurant, for 2 people with drinks. How much can that reach? Thank you Loredana! GPS in Dubai only directs you to main locations, so you would enter the name of the site like “Dubai Aquarium” then you would be directed there by showing left and right turns, but not street names. Also, packages work via DHL, FedEx, or through the post office by P.O. Boxes. Dinner in restaurants, as in any country, would depend on the type of restaurant, location, and what is ordered. I am glad you enjoyed the post. Wow, awesome post! I have never been here but have always wanted to check it out, your photos are great too, they really help tell the story! I also love that you included the concise interesting facts at the bottom too, thank you for sharing! The camels in the camel road from Ras al Khaimah was my favorite spot. But Atlantis was a fairy tail from another level. It reminded me of Aladdin. As I lived in Dubai for 1 year, I know quit a lot about it. I loved it and I would recommend to anyone to visit this stunning city! Thank you for your kind words Ashwini! I always try to write and post in the best way possible to help my readers. I love that place but cannot imagine myself living in Dubai, its way too hot for me but other than that its a great place to be. As you said, over the top exaggerated for sure but its amazing how they maintain everything. We were amused by the facts when we were there too, so interesting right!? Lovely description and photos. I went to UAE (Dubai) back in 2004 and I really enjoyed my time there! I have been bugging my husband for us to go there. The desert safari sounds like a lot of fun! Did you see any children on the safari? Do you know if they allow children? Thanks! I did see some children, but I think there is an age restriction on certain activities. I think kids who are under 10 who do the camel ride, must sit on a camel with an adult, and also there is an age restriction on driving the ATV’s on the sand dunes, I think it is 14 and over. Otherwise, I think kids and families are very welcome. Dubai definitely seems like a once in a lifetime place. The desert safari seems absolutely amazing, though pricy! Love the camel shot. I wonder if it’s possible to do Dubai on a budget? Though I suppose at a place like that, it’s just so tempting to go all out! Do you remember wat the vegetarian dishes was when you’ve been on the camel-trip, safari I mean? I think it must be amazing aw! Dubai and Abu Dhabi are some of my ‘go-to’s. What you’ve written sounds as if it was a wonderful experience (probably it was though). I would love to visit U.A.E. and also you’ve thrilled me with these facts about them! I did not know that! Wow- the safari is SO much cheaper than I thought it would be! I wanna get my glam on and visit friends of mine in Dubai, just can’t help thinking everything is out of my budget! I know a lot of people feel like because a lot of things in Dubai are so grand and big that they cannot or will not be able to afford certain activities but there are so many things to do for cheap and most hotels offer discounts to their guests for the activities, so dont let that hold you back Sarah. It can work out to be a fantastic trip for you. I would be nervous to travel here, but it does look so beautiful! 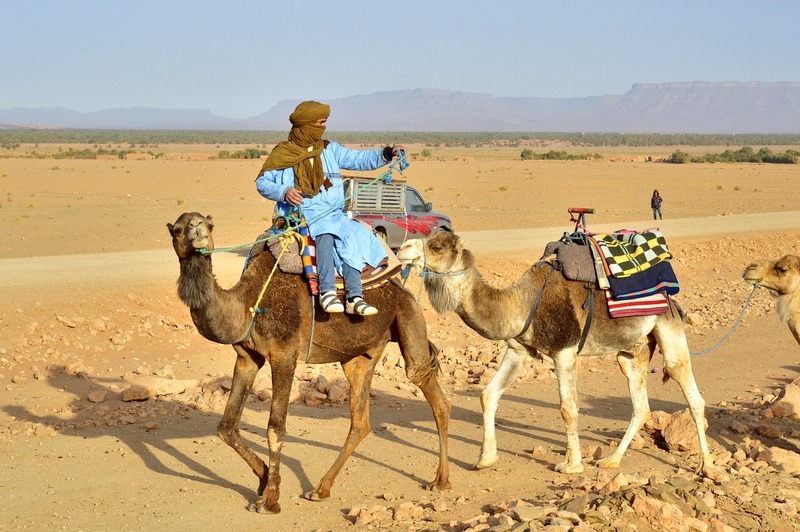 The camel ride excursion sounds like such an interesting activity as well! The Atlantis hotel looks like the one in the Bahamas, is it the same company? Have you been to both? Wahh… seriously? I had no clue that something existed like this – an ATM that hands out gold bares … sounds almost too crazy to be true 🙂 Must have been a cultural shock for you as fell the first time you traveled there? Looks definitely like a beautiful destination! Thanks for sharing! I am curious, if Dubai do not have any postal system, if you intend to purchase something online, where do you mail it to? and if someone wants to sent you something from overseas, how do they do it? Anyway, we do have the gold ATM in Singapore also, I have seen it in Orchard before. A FANTASTIC question Bernard. I only know the answer because I lived in Ghana (same procedure), and I asked the same question when I was in Abu Dhabi. You have to get a courier service like DHL to deliver it to a location like a business or school with the name on it in block letters, and c/o ( care of) whoever iy should be delivered to. OR you get your own P.O. Box, this is the easier less stressful version as your delivery is less likely to fall into the wrong hands. It takes getting used to, but once you get the hang of it, it is easy. Woah, I’ve always wanted to go! I can’t believe there are really ATMs that dispense gold bars…. When I visited Dubai we had put falconry and dune bashing on our list but ran out of time – maybe next time! What an awesome post and insight to the things you can do in the UAE. Thank you for the feedback Suanlee. I hope you get to visit sometime soon. You will have so much fun! This is such and amazing place, we went there last year and really just stopped over 1 night to say that we were in Dubai. Then we changed our tickets so we could spend more time. I did the desert trek and it was awesome. I have a friend, another blogger, who is about to begin teaching there for the next two years. WHOA! I have always wanted to go … And now I want to go THAT MUCH MORE! Wow! I have NEVER considered going to the UAE. You have changed my perspective. My husband actually works for a company headquartered in Abu Dhabi. Maybe we could find a way to make it a business trip. Great images as always!